If you are looking for a commercial roofing system that stood the test of time, look no further than RubberGard™ EPDM. This single-ply roofing system has been carefully designed by Firestone and has been widely used since the 1980s. Known for its extremely durability and flexibility, EPDM roofing is phenomenal choice for commercial applications. Due to the unique nature of low-slope roofing, specialized roofing materials must be utilized to ensure proper protection. Here at Sorensen Roofing & Exteriors, we have the experience needed to install commercial roofs of any size. If you are interested in learning more about RubberGard™ EPDM by Firestone, we invite you to reach out to your trusted Greeley commercial roofers for a free estimate. Our team provides commercial roofing services across Northern Colorado and Southern Wyoming, so reach out today to learn more. When it comes to your commercial roof, too much stress to the structure can lead to serious issues down the road. The good news is that RubberGard™ EPDM is extremely lightweight. This membrane weighs less than half a pound per square foot, which makes it a great choice for large commercial projects. Want to lower energy costs in your commercial building? Adding RubberGard™ EPDM might be just what you need. 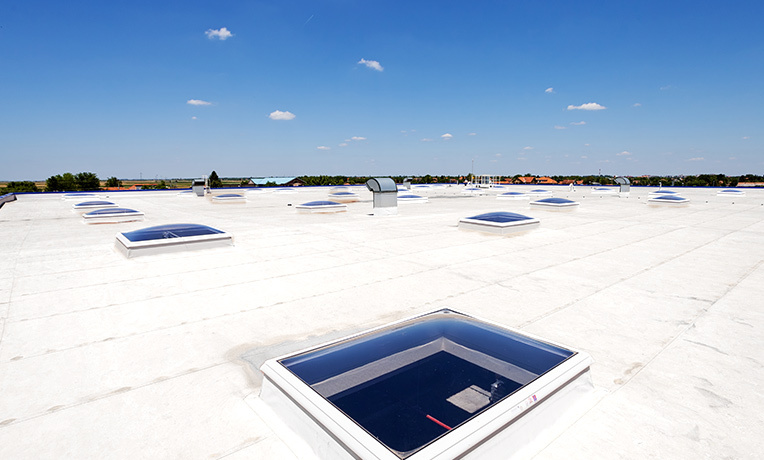 The installation of this system can lower your energy costs by up to 25 percent when compared to other roofing types. Once you have a commercial roof installed, you want it to provide you with protection for years to come. RubberGard™ EPDM roofs are capable of lasting upwards of 50 years, making them a solid investment for your business. When it comes to choosing the right commercial roof for your building, our team at Sorensen Roofing & Exteriors is here to help. As your Top-Rated local Greeley roofers, we are equipped to handle roofing projects of all sizes. If you are interested in utilizing RubberGard™ EPDM for your commercial roof replacement, we invite you to reach out to our team to learn more. Request a free estimate and talk to us about whether or not RubberGard™ EPDM is the ideal fit for your company’s needs.